Strong's Concordance - Demon or Angel, which will it be? Strong’s Concordance – Demon or Angel, which will it be? Strong’s Concordance is the tool that helped me find the four verses in the preceding chapter about Biblical Hebrew. It’s simply a study tool … like a hammer if you’re a carpenter. Strong’s Concordance of the Bible. A study tool to help you locate English words and their original Hebrew and Greek. You don’t need to buy the book … you can consult it online. Strong’s Concordance, like Dr. James Strong its author, comes under more or less heavy criticism in certain theological circles. Make no mistake about it, you’ll read a fair bit of negativism about this duo, I have. And I agree, just as you can smash your fingers with a misplaced hammer blow, so can you be misled by mis-using Strong’s concordance. On the other hand a carpenter wouldn’t go anywhere without a hammer and knows that it’s an integral part of his toolkit. Just like one needs training and experience in the use of a hammer, so it is with Strong’s. However, you’ve got to have the right trainer and the right apprenticeship. There are other concordances/tools available for Bible study and they all have their positive and negative points like hammers and putters. I have chosen Strong’s because it is one of the oldest and because it is simple to follow for Bible students not acquainted with Hebrew or Greek. In saying ‘it’s simple to use’ I don’t mean that Strong’s is simplistic in its approach. In fact many detractors don’t know how to use Strong’s to reveal its full potential in helping students progress with their Bible study. Now, if you just happened to click on a link that brought you to this page you might very well be wondering what this is all about. I would suggest that you take a few moments (it won’t take long) and go back to the beginning of this section by reading, in order: Why Theology?, Sacred Books, The Bible and Biblical Hebrew. This will give you the overview to put you at ease and allow you to follow along with the development of this important subject. Dr. James Strong was born in New York in 1822 and settled in Flushing where he built, organized and became president of the Flushing railroad. He was also heavily into Theology and Divinity. He taught for some three decades and was Professor of Exegetical Theology at Drew University in Madison, NY, then known as Drew Theological Seminary, before he died in 1894. You can read a short but interesting article about his varied life achievements here. His ultimate contribution to Bible study, as an etymologist, studying words and their meaning from the context, is Strong’s Exhaustive Concordance. It’s Strong’s Concordance that I’ve made accessible online for Bible Study. Actually all Strong did (and that is not intended to be negative in any way… to the contrary, we owe him a great deal of respect considering there were no computers in his day!) was FIND and GATHER ALL English words in the King James Version (KJV) of the Bible (translated in 1611) in the Old Testament that had the SAME HEBREW origin. Same for the New (Greek) Testament. Another way of putting this is: Strong made a list of ALL the unique Hebrew words in the Hebrew Bible. There are some 8600 such Hebrew words. He, and his team, then went through the entire King James Bible and for EACH English word they found its Hebrew origin and tied/associated it with one of the approximate 8600 Hebrew words. He did the same for the Greek which has about 5000 words in the New Testament. For ease of reference he attributed a number, from H1 to H8675 in Hebrew and G1 to G5625 in Greek so people who didn’t speak these biblical languages could still locate and study the Hebrew and Greek words. So, what you have essentially is a Hebrew word followed by ALL the translations the King James translators attributed to each display of the word. By using the online concordance you can quickly and easily find both ALL the English translations AND the verse location of ALL these English words (which means everywhere this unique Hebrew or Greek word) is found in the Bible. This was a humongous task, but it is a precious ongoing legacy to aid Bible study. There are some reflections on the Concordance, but these are few and far between in comparison to the vehemence one can find with regard to Strong’s definitions. 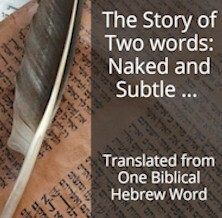 These definitions for each Hebrew and Greek word are quite limited in length and scope. In fact I would say they are rather simplistic. Many modern, especially online, concordances add additional information, from various other sources to ‘beef up’ and maybe ‘diminish’ Strong’s definitions. No theological work, be it the King James Translation of the Bible or Strong’s Concordance is ‘perfect’. Each has its positives and negatives. However, if we want to make progress, then we need to learn how to make the best use of the best, but imperfect, tools available to us. In the upcoming Origin of the Universe there’s a chapter devoted to Strong’s Concordance where I develop some of the positives and negatives. In online video courses, I’ll be further explaining the pros and cons of Strong’s Concordance and especially how to use it to aid Bible study while being aware of its foibles. For now, keep in mind what Strong’s Concordance is NOT. It is NOT theology, the study of “Theos”, God. It does not give any “new” knowledge, it reveals no truths, does not layout any religious concepts, draws no theological conclusions. All it does is “organize words based on their roots” and gives some guidance notes which we can analyze. I will conclude by saying that I’m using Strong’s so that visitors know I’m not doing my own translations or using my own words. This is a 3rd party. James Strong, just like the one hundred translators of the King James Bible, is criticized like all other authors, for his ‘authenticity’ and ‘orientation’. But the fundamental question is, are they honest and truthful in what they render? Are they trying to be true and faithful to the original? These are works done in the late 1600’s and 1800’s before a lot of scientific information about the nature of the universe, the nature of man, neurons and the mind was around. Today, some 3-400 years later, despite their weaknesses, outweighed by their strengths, both the KJV translation and Strong’s Concordance are considered mainstays in the quest to understand and unlock Bible meaning. Since you read all the way to here… you liked it. Please use the Social Network links just below to share this excerpt of Inventory of the Universe, Strong’s Concordance – Demon or Angel, which will it be?